On this edition of Vox Pop, we welcome renowned astronomer Bob Berman to the studio to field all of your Astronomy-related questions. One of the best-known and most widely-read astronomers in the world, Bob can translate complex scientific concepts into terms that are easily understood by the casual stargazer, yet meaningful to the most advanced researchers. WAMC's Ray Graf hosts. 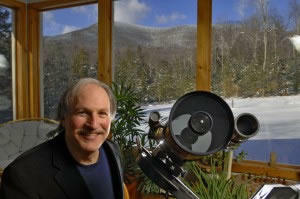 Today on Vox Pop, we look to the stars with world renowned astronomer Bob Berman. It's the Astronomy show hosted by WAMC's Ray Graf. A meteor exploded in the sky over Russia this morning that officials say blasted out countless windows and injured over 1,000 people. WAMC's Brian Shields spoke today with world renowned astronomer and frequent Vox Pop guest Bob Berman about today’s amazing astrological phenomenon. The asteroid “DA14”, which will hurtle past us sometime after lunch today, was discovered by Spanish observers last year. Our highest satellites, used for GPS, are just over 22,000 miles up, and DA14 will pass underneath that level – coming about 17,000 miles from us. Fortunately, NASA assures us we are safe. Now Earth and Moon have been hit many times, over the eons, by asteroids.The explosive 1908 Tunguska asteroid, a similar size to the one passing us on Friday (which for a while many suspected might have been a mini-black hole) damaged 800 square miles of Siberia.